Yokohama Kaigan Kyokai(Church) was founded on March 10.1872, as the first Protestant church for the Japanese in this country. At the time of its establishment, it inherited the faith and tradition of the Reformed Church and Presbyterian Church in the U.S.A. The first pastor was Rev. 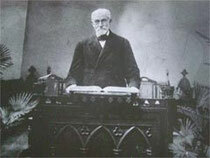 J.H.Ballagh, who arrived in Yokohama with his wife in 1861 as one of the earliest Christian missionaries, after studying at Rutgers College and New Brunswick Theological Seminary. Rev. Ballagh encountered considerable difficulties in his initial missionary activities in Japan, but in 1872 he and 11 Japanese established the first church for the Japanese. Initial worship and gatherings were held in a small, stone-made chapel located in the corner of the current church site. In 1875, a larger church building was built, and on this occasion a church bell was donated by Mrs. Marry Pruyn, an American citizen. 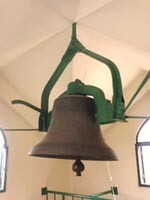 This bell is still ringing from the tower building on every Sunday. The original church building was completely destroyed by the Great Earthquake in 1923(known as KANTO Dai-Shinsai), and the current building has been designated one of the historical building in Yokohama by the City Authority. "until the Spirit is poured upon us from on high. and the fruitful field is deemed a forest." This marked the very beginning of this church, and this occasion is still remembered as the Pentecost in Japan. The faith in our lord has remained with this church since then up until today, and even during the Second World War when Christians where put under the severe suppression and persecution the weekly worship was maintained without interruption under the God's grace. The total number of Japanese who have been baptist ed at this church amounts to no less than 6,000 since its establishment in 1872. Worship is only in Japanese.